Compensatory effect is observed during the process of gradual adaptation of plants to abnormal environmental conditions; nitrogen fertilizer compensation has been extensively studied in rice production in recent years. However, metabolite production of the phenomenon has not been studied clearly. In this study, we used super hybrid early rice as the material and planted it in a barrel. 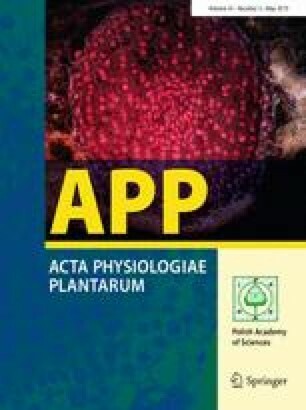 Experiments were performed under two conditions of treatment, namely, CK (normal quantities of nitrogen fertilizer distribution at different growth stages) and T1 (nitrogen deficiency at tillering stage and compensatory application at young panicle differentiation stage). Liquid chromatography–mass spectrometry (LC–MS) was used to analyze metabolomics of rice leaves under conditions of nitrogen deficiency and compensation after the same period of CK treatment. Results showed that there was a significant difference between T1 and CK metabolites. The levels of stress-resistant substances and amino acid substitution product nitrogen deficiency increased under T1 treatment compared to CK, and the metabolites were consumed as the energy source. However, after compensation, the levels of the stress response products returned to normal, lipids were synthesized in large quantities, and fatty acid accumulation had increased. The online version of this article ( https://doi.org/10.1007/s11738-019-2860-7) contains supplementary material, which is available to authorized users. This study was supported by the National Natural Science Foundation of China Grant no. (31360309 and 30860136), Jiangxi Science and Technology Support Project of China Grant no. (2010BNA03600).